Although Poker, and any card game for that matter should always be played fairly, so everyone gets the most fun out of it, below I collected some of the most common methods for cheating at Poker. Even if you do not want to do so, knowing how to cheat at Poker can be useful to spot cheats at your table. If someone draws your suspicion, you know what signs to look for to determine whether that person is cheating at Poker or not. Most of the techniques that fall into the second category are not considered real cheating, rather so-called angle shooting. Angle shooting is a controversial subject, and the line between it, and actual cheating is blurry. However, angle shooting techniques are recognised as unethical ways for a player to gain advantage over others without actually breaking the rules of the game. Angle shooting is accessible to anyone who has the nerves, but learning how to cheat at Poker is a different story. Real cheating usually involves some sleigh of hand at some point and it takes serious time and practice for someone to learn how to cheat at Poker using these methods. Below I present some of the most common, ‘skill heavy’ ways of cheating at Poker as well as some tips on how to spot players using these techniques. When a cheat is “mucking” he is cleverly hiding cards in his hand, to later switch his/her hand for. Cheating at Poker this way is the most effective in a team and even more so, if the cheat conspires with the dealer. How to spot someone cheating at Poker this way – the hand mucker needs to hide the mucked cards somewhere, and eventually switch it to one in his hand. He will use some kind of distraction, like reaching down to tie his shoelaces (okay, maybe not this obvious, but you get the idea). Look for these signs if you’re suspicious. It’s a sleight of hand technique in which the bottom card from a deck of playing cards is dealt instead of the top card. The use of the so-called mechanic’s grip can give away the false dealer. Also, unless the dealer is particularly skilled, the technique produces a slightly different sound from standard dealing, and the second-to-bottom card may be drawn slightly out of place. A similar technique is “second dealing” which involves dealing the second card, instead of the top one. How to spot someone cheating at Poker this way – Bottom dealing requires the dealer to hold the deck with the so-called mechanic’s grip when dealing (see below). The dealer grips the deck with the index finger in front of it or his pinky and pointing finger on both short sides of the deck while the other fingers support the deck while the cards are being beveled slightly. Watch out for dealers who master this grip, cause they definitely know how to cheat at Poker – even if they don’t want to. However, don’t be fast to draw conclusions, as the grip is also taught in many professional dealer schools around the world. How to spot someone cheating at Poker this way – A picture of the grip below. Look for a dealer holding the cards like this, cause there’s a good chance he knows how to cheat at Poker. 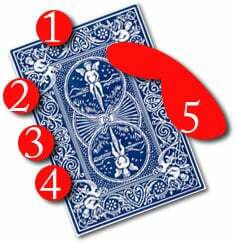 A cheat can place certain cards in a position favourable to himself or his partner. Stacking is more often used than bottom dealing, cause it looks less suspicious. Stacking can happen during the shuffling of cards an it’s definitely an effective way of cheating at Poker. How to spot someone cheating at Poker this way – Cards can be stacked during the riffle shuffling, however, this is the hardest to master and also to spot. When cheating at Poker using the Overhand Stacking technique, the dealer tracks certain cards through the overhand shuffling. It’s a group of players secretly forming a team and playing in a manner to benefit the teams as a whole and giving them advantage over other players. You can spot the conspirators cheating at Poker, or any other card game this way by the signals they use to communicate with each other. How to spot someone cheating at Poker this way – You have to look for the signals they use to communicate: a cough, scratching one’s nose, ears, etc. the better the cheats are, the subtler the signs. The cheat marks some cards, so he can determine what kind of hand his opponent has by looking at the back of the cards. Cheating at Poker this way is effective, but requires the previous modification of the deck and its hard to come up with such subtle signs that the other players can’t notice. How to spot someone cheating at Poker this way – look for any idiosyncrasies of certain individual cards to the smallest detail, if you’re suspicious. Collusion – It’s much the same method as its offline counterpart. You secretly partner up with another player at your table to gain advantage. Only it’s much easier to manage online and the only way to spot cheats is to observe their play. Cheats, who even know how to cheat at Poker offline with this technique will be unbeatable online. Multi-account – It’s the simple method of creating multiple account on the same site and playing with them at the same tables – basically collusion with yourself, as schizophrenic as it sound. It’s a working method and very hard to spot, even harder to prove. However, Darren Woods, a World Series of Poker bracelet winner in 2011, has been sentenced to 15 months in jail recently for cheating at Poker this way. He’s scam was uncovered by diligent members of the poker community who, after analysing his play determined, that his win-rate was too high to be legitimate. This case represents the single edge honest players have when trying to uncover a cheating scheme: the availability of digital historical data. Data analysis gave away online Poker cheats in most reported cases. Ghosting – Ghosting basically means, that the player has a ‘coach’, and advisor who helps him choose the best tactics while playing. It is a practice forbidden in live tournaments, but it’s downright impossible to enforce online. Cheating at Poker this way means serious advantage to the player, cause he has someone to discuss and reflect on difficult situations when they occur. It’s also completely impossible to spot for other players. Poker bots – A Poker bot using carefully crafted algorithms can be profitable on the long run. Needless to say, that these bots are not really retailed as consumer products. A bot cheater would probably need to code one himself or acquire one somehow. It must be noted, however, that support Poker bots, like the Neo Poker Bot do exist, but these are not designed for autonomous play. Therefore cheating at Poker this way definitely requires IT skills or at least connections. Viewing hole cards – Viewing whole cards systematically is impossible in a live game. However, in 2006 a scandal regarding Poker platform Absolute Poker fired up, because a player allegedly had access to a super-user-account and was able to see the cards of his opponents. However, no such scandal was reported since than and there is obviously no uniform method as to how to cheat at Poker online this way, but hackers and malicious employees might exist and the average player has no means to defend himself against these. There are, of course many more ways of cheating at Poker. Note, that this is not, by any means a guide on how to cheat at Poker, merely an introduction to the general techniques used by cheats and some tips on how to spot them. I do not recommend cheating at Poker to anyone. If you think there is a cheat at your table (online or offline), observe him carefully and look for the signs that could give him away. If you’re not interested in how to cheat at Poker, check out my guide on how to make money like a professional gambler using advantage gambling methods for more ethical ways for turning gambling profitable. You can also check out my angle shooting guide to know which are the methods that are not considered cheating at Poker expressly, but are still unethical and frowned upon by players. An overview on how to cheat at Poker and how to spot other players cheating at Poker, both online and offline.